Have you ever pealed an onion, and taken layer and layer off of it until you hit the heart? Welcome to the bar floor. 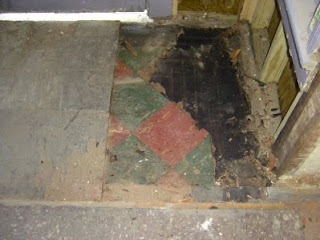 Although below picture doesn't give it credit, what you are looking at (from bottom, to the left, middle right) are a layer of vinyl flooring, plywood, vinyl flooring, plywood, vinyl flooring, 3/8 inch oak flooring, and not seen in the picture, the original plank flooring (I apologize if I missed a layer or two). We are talking about four inches of flooring material!!! I stripped the entrance floor down to the original board flooring so that I would have a reference of height for the door frame. 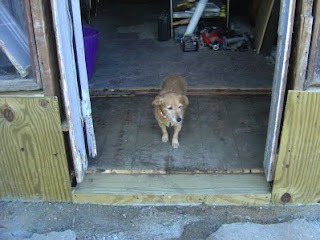 Here you see the plank flooring, along with a four-legged critter, which likes to hang by the door. Aside from that the usual happened: Painting for E! 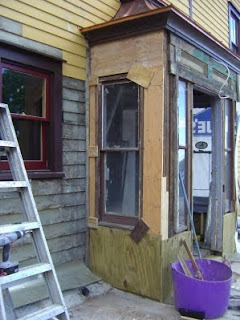 and working on the entrance for me.